Gone are the days when work meant slogging in a cubicle from 9 to 5. 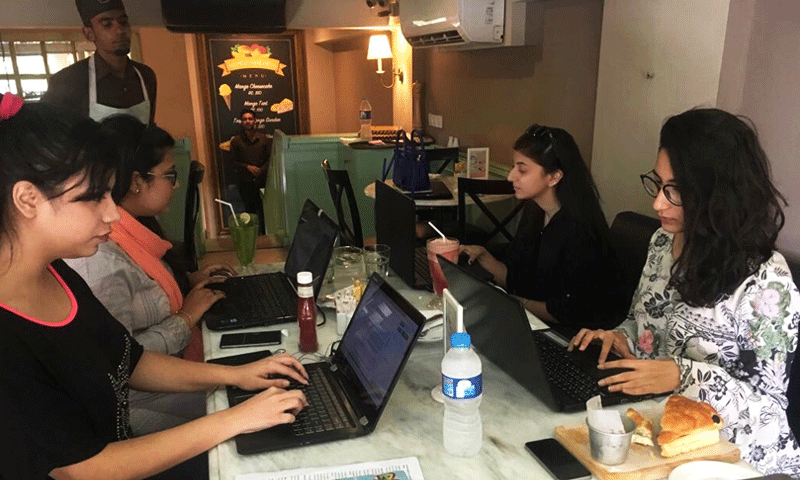 Freelancing or project-based workflows have become increasingly common in Pakistan, and more often than not people are found working at home. However, some feel the need for a change of environment to get into the ‘work zone’, and if they’re not signed up at a co-working solution, then you’ll find them buried behind their laptop at a cafe. But of course, all cafes aren’t created equal for work purposes. 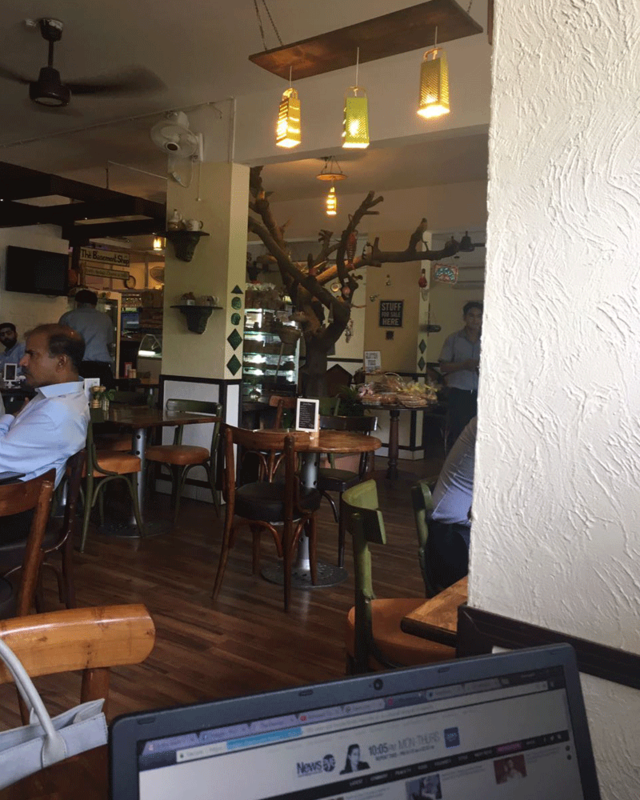 The Images team hit a bunch of Karachi’s most popular cafes last week to see which ones are work-friendly. Could they really be a substitute for a home office? We looked at the following factors before making our judgement: accessibility (WiFi/power outlets), staff attitude, ambience, food and affordability. Here are the cafes we worked from and how they ranked. If only we could say that this was a one-time thing. We’ve tried working at Gloria’s a number of times and it has rarely offered a decent connection… and their staffers don’t really care much. Even if we’d bring our own WiFi device, the ambience isn’t the most work friendly; it’s loud, oddly warm and the seating feels congested. They do have decent socket locations though. This place is usually a favourite spot for a hearty meal but it was a major let-down as a workspace. We went on a Wednesday around 10am and as usual, their morning was busy. The first thing we asked for was a socket for our laptops and we were told there’s only one, that too next to the loneliest table behind a pillar. 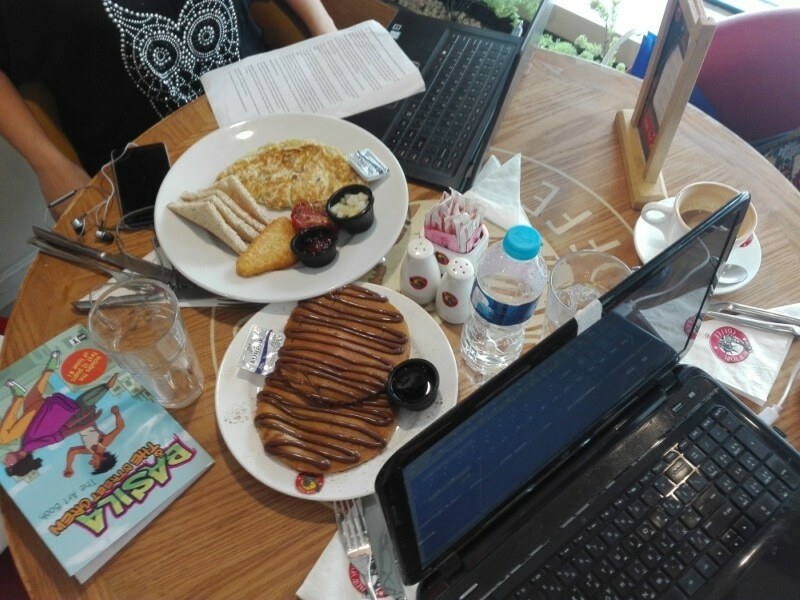 Though it did provide privacy, it was too squished in a corner and the table barely had space for the food and laptop. The WiFi worked fine in the beginning, but as the light kept fluctuating the internet died after a while. The service was good but unfortunately, the food wasn’t up to the mark – don’t know what went wrong – the fresh juice was the only saving grace tbh. 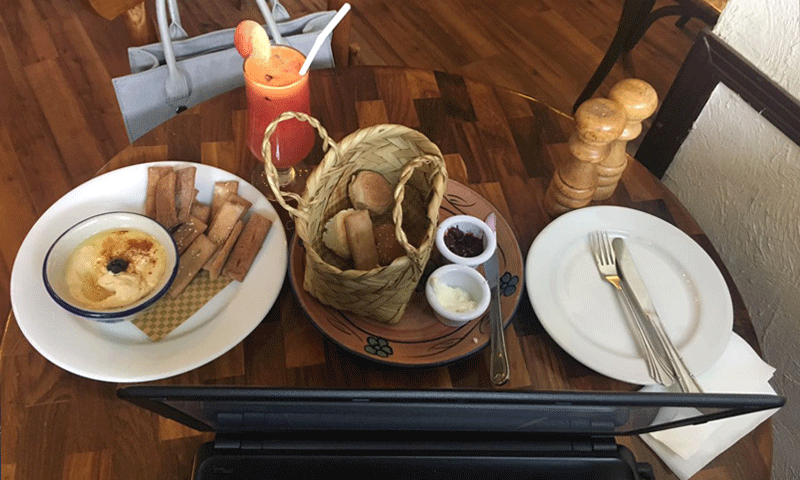 Lacking any cushioning, the cafe’s wooden chairs can make you feel sore after a while. If you’re thinking of working here, it’s best to stay for an hour or two at best – and bring your headphones along, the chatter (and lack of music) can get bothersome. It’s unfortunate but we left Neco’s with a bad taste in our mouths – pun intended. 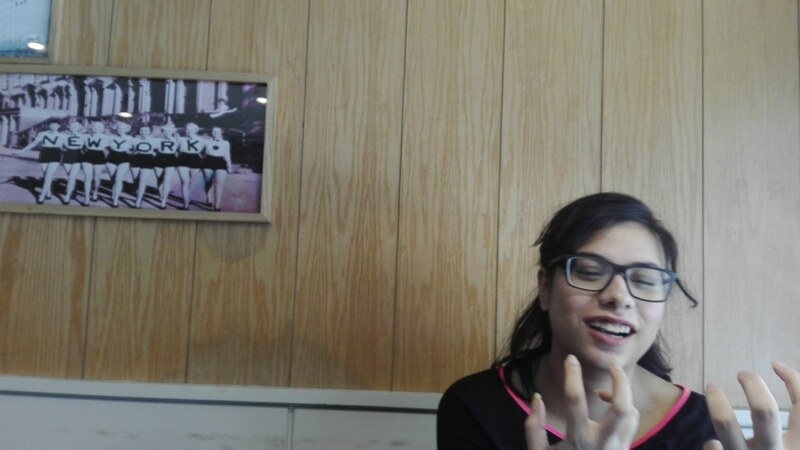 We visited the Dunkin Donuts on the main Shahrah-e-Faisal/Tipu Sultan intersection at around noon. It was relatively quiet – no music, so you can hear your own thoughts (bonus!). The usual sounds of the city and occasional tings of the cash register give it a small town coffee shop vibe. No flies, good air conditioning and ample sunlight – all make for an energising ambience to help late risers get crackin’ without wasting more time. The staff was friendly. The coffee was great too (for non-coffee snobs). And the prices here are a win, food and drinks are perhaps as cheap as it can get with quality control. A separate smoking area outside was also a major plus! However, there is no WiFi at DD so you’ll have to carry your own WiFi device. That is the one thing DD really needs to work on, considering that it’s located in an area bustling with office-goers. 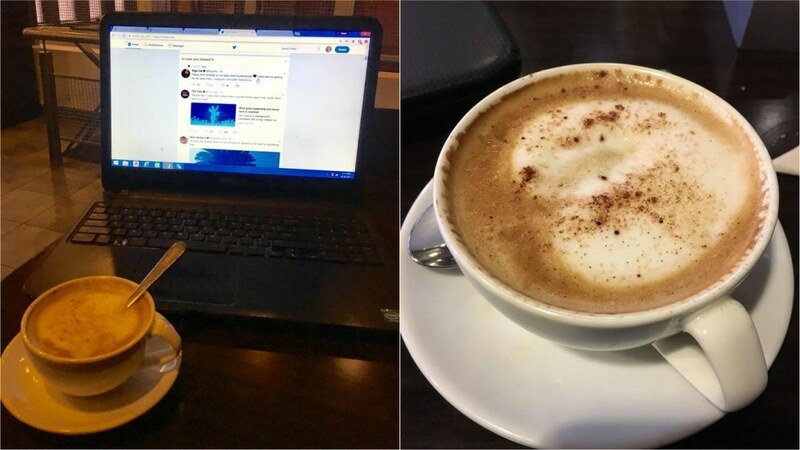 The Espresso at Tipu Sultan has WiFi and a friendly staff that plugs in your laptop for you. The coffee is good too. 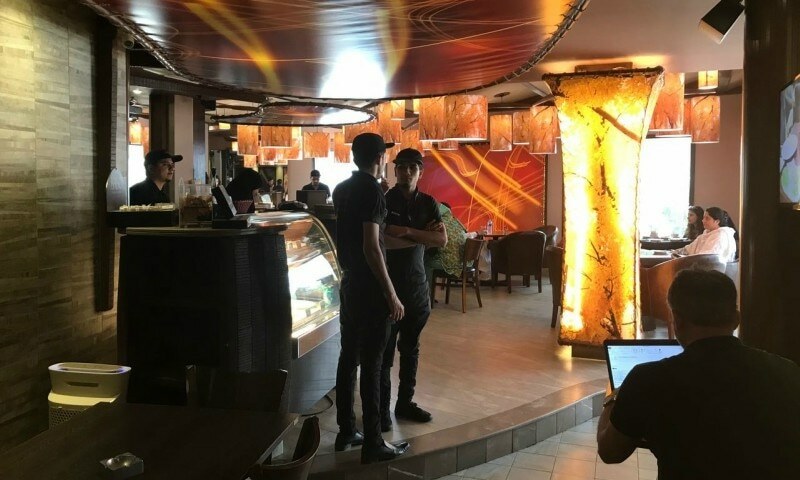 The music can get too loud at times to allow for much thought; since it is more cafe than coffee shop, it can get noisy with chatter and children running around. 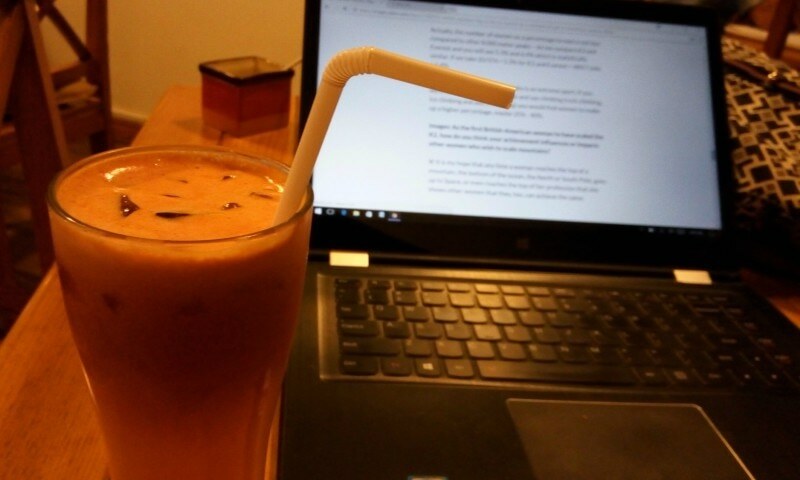 The Espresso on Shahbaz isn’t any better for people looking to get some work done. Although the WiFi was good, the staff wasn’t very helpful and the upstairs windows are tinted so it’s quite dingy and dim, even during the day. Not the most positive place to start your day from. See what we mean about it being dim? That being said, Espresso does serve the best mochaccino in town so big thumbs up for that alone. Located on Shahbaz, Mocca offers spacious accommodation for those looking to huddle away from the world. The cafe is clean and clutter-free with spaced-out tables. However, its very spaciousness makes it a bit of an echo chamber: every sound in this cafe seemed to be amplified. If you love a quiet, hushed space this might not work for you. Pros: they’ve printed the WiFi password on their menu – genius, because then you don’t have to ask your server for it. The WiFi was mostly consistent and electrical outlets were conveniently located under our seats. The staff is unobtrusive and leaves you be until you call for their attention. However, the place gets busy after 5pm and music mixed with chatter don’t really gel well, so if you’re planning to work late you’ll need headphones. The seats weren’t uncomfortable and the bright white lights overhead were a major buzzkill. It was actually so bright inside the cafe we felt we were working at an airport or a doctors office. Not the best. Non-smokers will love it for being smoke-free. Also, food is on the pricey side… and not something to write home about. This one was a pleasant surprise. 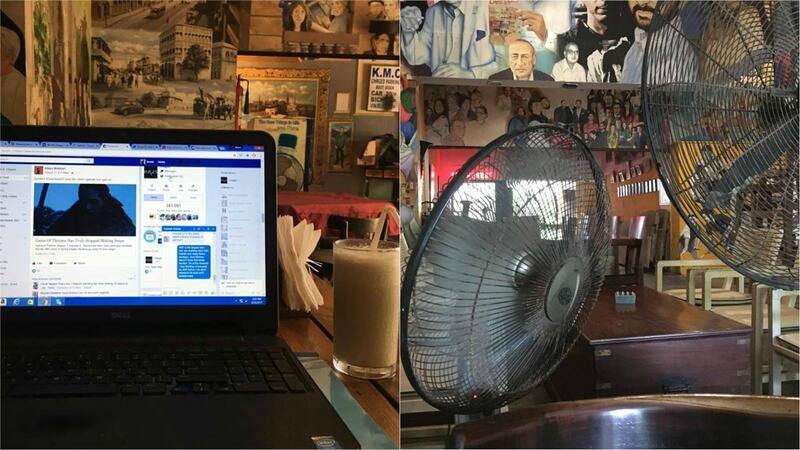 We’ve always liked the vibe at this little joint but we didn’t necessarily think it was the best place to work from, especially in this weather during the day time. That being said, having spent three hours during the afternoon there, we didn’t really feel hot even once. The staff was extremely courteous, setting up three fans around the table; they even agreed to open early for us since we got there at 2pm and they usually open at 3 pm. However this might be a deal breaker for people who want to get work done in the morning. Nevertheless, it was peaceful and quiet, the food was easy on the pocket too, lots of sockets — and they had excellent WiFi! New York Coffee at Sindhi Muslim offers a lot of convenience to workers-on-the-go. 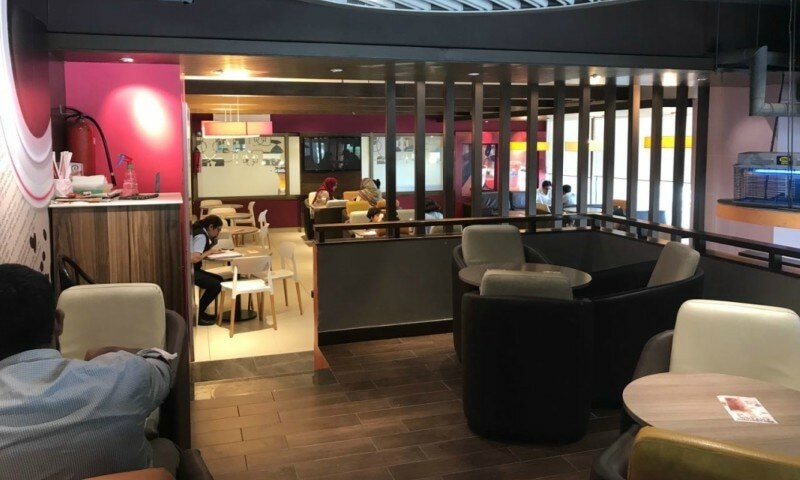 There are quite a few laptop charging slots, you can smoke upstairs (if you feel the need) and there’s a wide variety of breakfast options that are reasonably priced. What could be frustrating is the hot-and-cold internet that at times completely gives up, but thankfully it didn’t happen that much, we were able to get our work done. The chairs are cushy but the music can be loud; however, the friendly staff will turn it down for you if you ask them. Service is generally quick at NYC, and the staffers generally leave you alone so that you can work in peace. 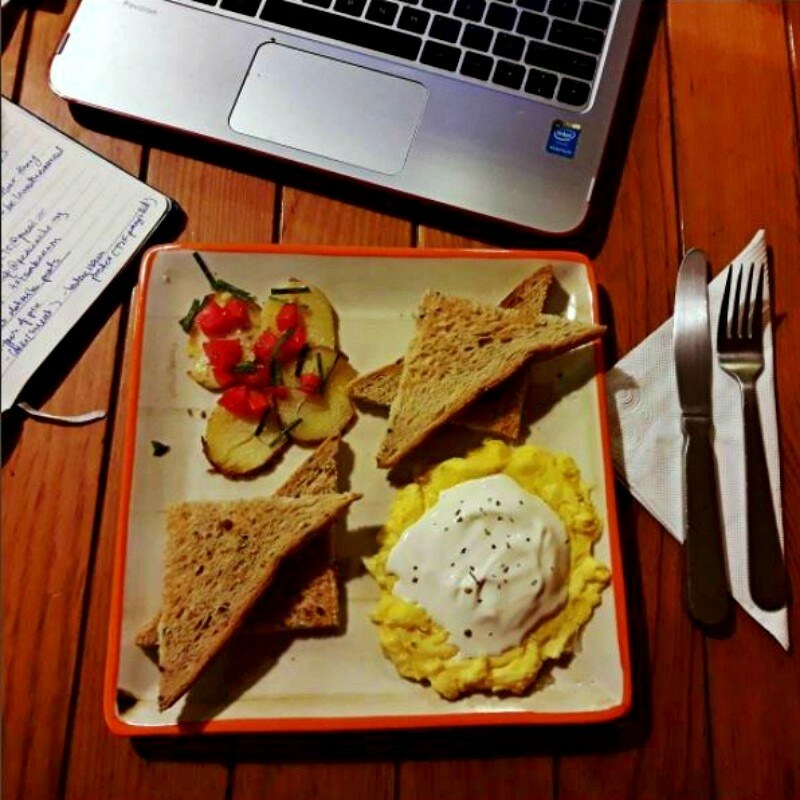 If you’re looking for a work space that offers good food, has a nice comfy vibe and friendly staff, Floc on Zamzama should be your go to place. It’s a small place with eight tables but the service is good and food, insert thumbs up emoji. We went there around 9.30/10am on a Friday; there was little sign of civilisation, which allowed us to sit wherever we liked, the music was perfect for mornings (trust us, very few places get it right). 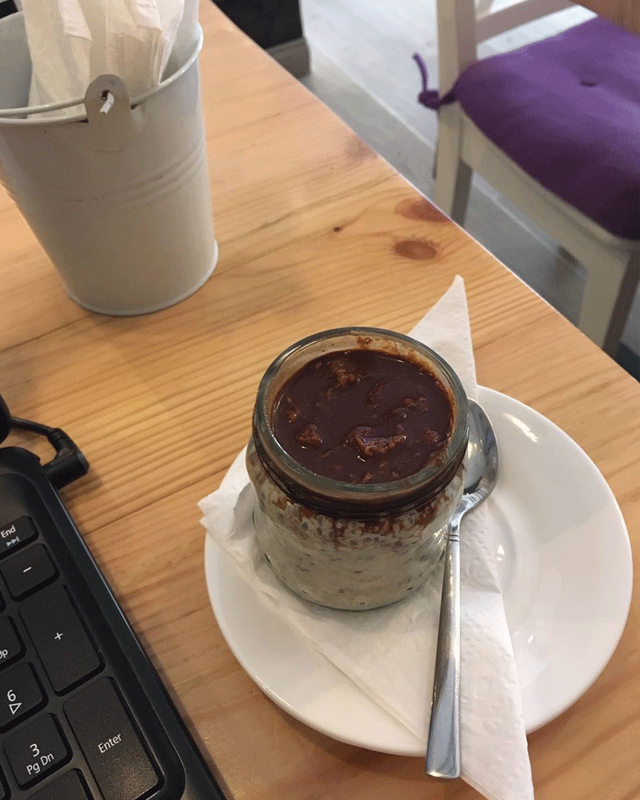 Here’s what we loved: the place is lined with sockets along each table; it’s not too heavy on the pocket, also they make in-house almond milk. Winning? Totally. However, the WiFi was a bit of an issue; it kept going off for a few minutes from time to time and it’s not smoke-free (bummer) – though they have an air purifier! Probably our favourite feel were the large windows, you get the warm feel of the sunlight, and there’s a sense of calm due to the lack of activity outside – since it’s located right near the end of 10th Zamzama lane. Note: if you plan on sitting for long hours your best bet are the sofas, otherwise you’ll be sorry.. ouch! We’d be crazy to talk about working out and not mention T2F. 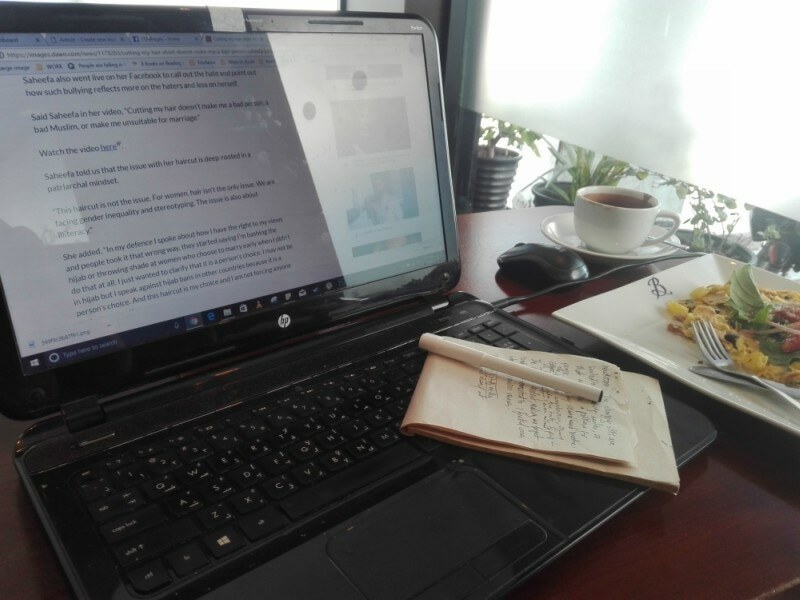 The cafe is known for having many freelancers working around and for good reason. 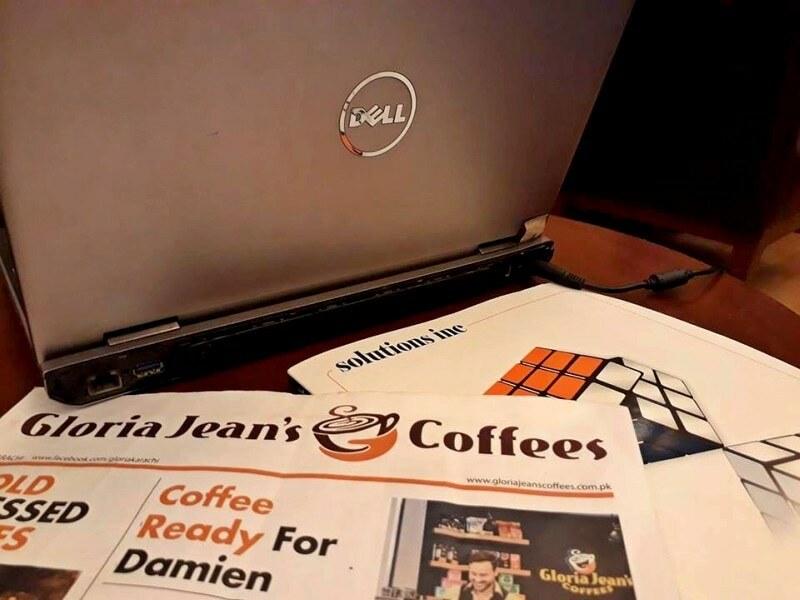 There are numerous sockets, decent WiFi and the most work-friendly ambience around. The seating can get a little uncomfortable if you sit too long but a little break from the table can fix that. 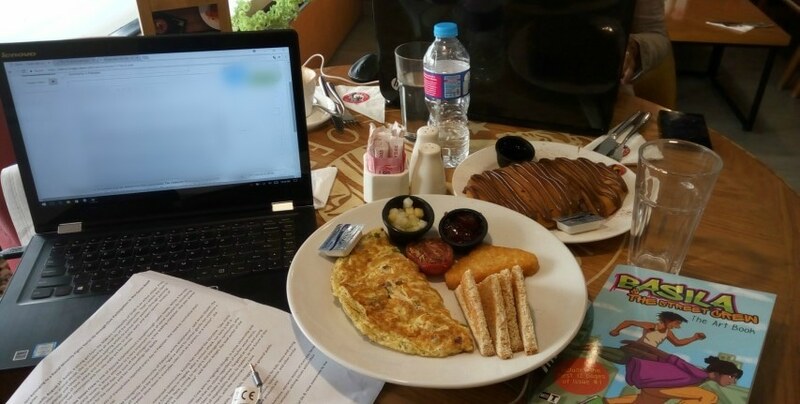 Being so work friendly, T2F cafe only asks that you order for a minimum of Rs. 150 every hour. But it’s nothing alarming as T2F has some of the most affordable food and drinks around. Majority of the menu comes under Rs500 and that includes their meals. Snacks and drinks are all under Rs300. The staff leaves you alone and makes a round every now and then just to check up on you. The only issue that T2F has for us is the location. T2F cafe isn’t exactly central, it’s really far away from most of the other cafes we frequent (so cafe-hopping is a problem). Unless you live close by, it is difficult to make a plan to get to T2F just to work. Lal’s is a bustling place, located right on main Shahbaz, so you can expect a crowd at all times of the day – especially in the tiny upstairs portion. This might not be for you if you want privacy. However, can we just say that the WiFi at Lal’s is awesome, better than the one at work! We could Instagram, update stories, work without any issues. Total win. Sorry, had to let it be known. Here’s what else we loved: The windows! 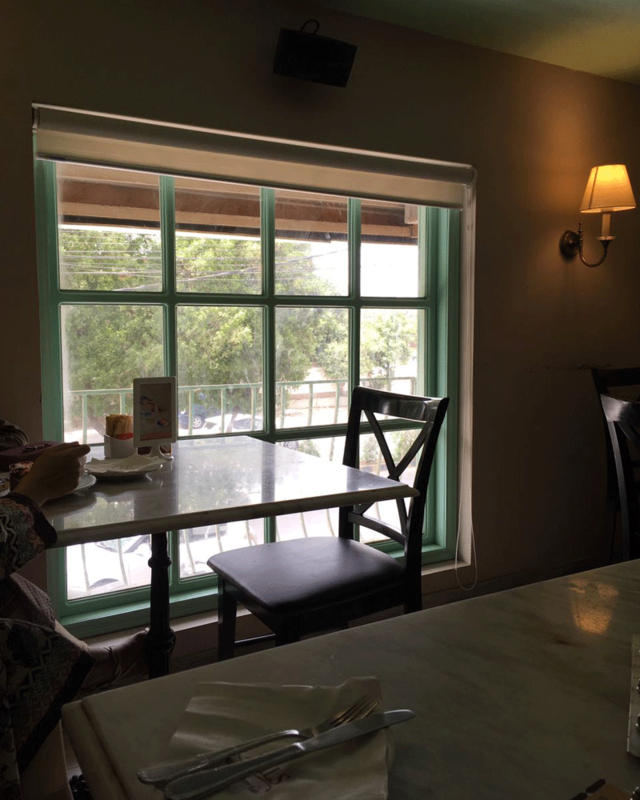 Lal’s interior has a vintage feel to it and its English windows are the best part. The place was bright with indirect sunlight which honestly is the only kind of sunlight we can handle in Karachi. For those who need sunlight to get their creative juices flowing this will definitely serve as motivation.The tables were big enough to accommodate all five team members – yes all, and allow easy conversation. The menu offers affordable items but service needed attention, we had to keep calling for the staff. What didn’t work for us was the music. Like our co-worker said, “It’s like you’re in Florence” but not in a good way, work mode requires some upbeat music. For people who like smoking, the upstairs area works, but if smoke irks you then it’s not the ideal place to sit as the space is small and the smoke can get to you. 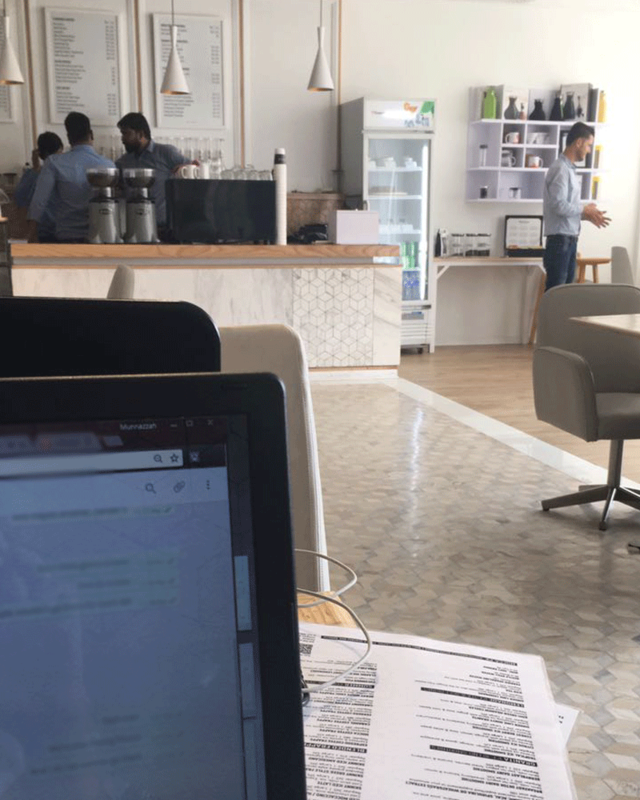 Unfortunately for a place offering such a pretty interior, working on a laptop can be a bit problematic because not every table has access to an electrical outlet. 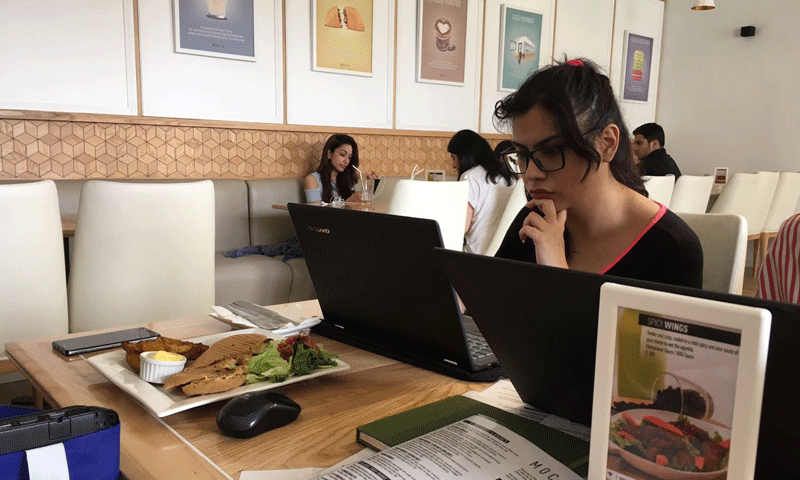 With stable WiFi, comfortable seating and a menu that offers something for everyone, Butler’s was a surprise hit when we set up our workstation at the popular Zamzama cafe one morning. Not teeming with patrons on a Thursday morning, the noise level was tolerable but it wasn’t serene – but hey neither is our newsroom on most days. The charging points for laptops are limited to the smoking section so that might pose a problem for people bothered by secondhand smoke. The staff is courteous, offering to huddle under the table to plug in your laptop before you even have to ask. The BIGGEST plus at Butler’s – and this bears repeating – was their excellent WiFi, which made us forget that internet connectivity could be an issue in the first place. The downside to Butler’s is that you can’t get too attached… breakfast and coffee can cost you over a Rs. 1000 easily, so not everyone can afford the daily trip!